Riccardo Maiolini is an expert of entrepreneurship and social innovation. His research interests are focused on social innovation, social entrepreneurship and corporate entrepreneurship. He is one of the two curators of the Italian Index of Social Innovation. Former post-doc at CeRISS (Research Center for Social Innovation at LUISS University), he is one of the authors of the Italian reports on social innovation edited by Franco Angeli in 2015. 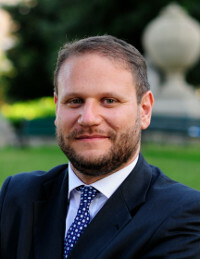 Professor Maiolini’s activities in the entrepreneurial Italian ecosystems are various: he participated in the organization of international startup programs (in partnership with the Italian embassy of Israel and the Italian embassy of the USA) and was one of the promoters of the first startup barcamp at the New York Stock Exchange in 2014 (UsaCamp project). During the UsaCamp roadshow, Professor Maiolini received an award from the George Washington University and the “International Council for Small Business (ICSB)” for his dedication to foster social innovation in Italy. Professor Maiolini also teaches in the Center for Professional and Continuing Education at John Cabot (introduction to business plan; business planning). Courses taught: Strategic decisions for entrepreneuship; e-Marketing; Principle of management; International Management.